There’s something about Mary that we shouldn’t miss this Christmas time – I’m talking about the mother of Jesus, not the 1998 film! In Luke chapter 2 we read that Mary had just been visited by a number of very excited shepherds. They had come to find the Messiah who, they had been told by an angel of God, would be lying in a manger in Bethlehem. The Messiah; the Saviour; the Lord – the baby in her arms! Then in Luke 2:19 it says “Mary treasured up all these things and pondered them in her heart.” I think that line is put there as a point of application for us. Mary “pondered” what she had seen and heard, she meditated on them - we might say “she took time-out to think”. This caused her to “treasure” these things – it brought her deep joy. That is Mary’s challenge to us this Christmas. In all the frantic activity will we do the same? Will we make and spend time this Christmas to think, ponder and treasure the precious truths we know? Will we grow to appreciate the gift of Christ more this Christmas? 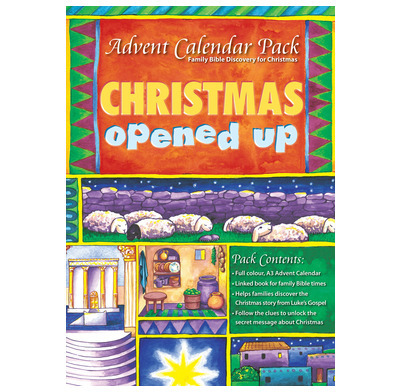 If your kids are young… This advent calendar has short devotional readings that go with it. It will help you stop and read and rejoice. It will also reinforce the expectation that we read the Bible as a family. What a great time of year to start! If your kids are a bit older - if you have already started a system of Bible reading as a family, XTB is designed to be done over the dinner table. If you have always wanted to, but never know the right time to start. Now! Christmas. If your kids are in secondary school - we have read through this excellent seasonal devotional as a family. Short enough to be done every night at dinner. Full of material you will want to follow up.